Elkwallow Picnic Area, finally…after two hours in the car! Sidekick Pauli was whining to get on the trail, I was waiting for two backpackers to finish with the privy. Ahhh…finally. On the trail at 11:07am…wow, it was windy! I stopped to check I had everything I wanted at 11:10. 🙂 I always feel like I am forgetting something. 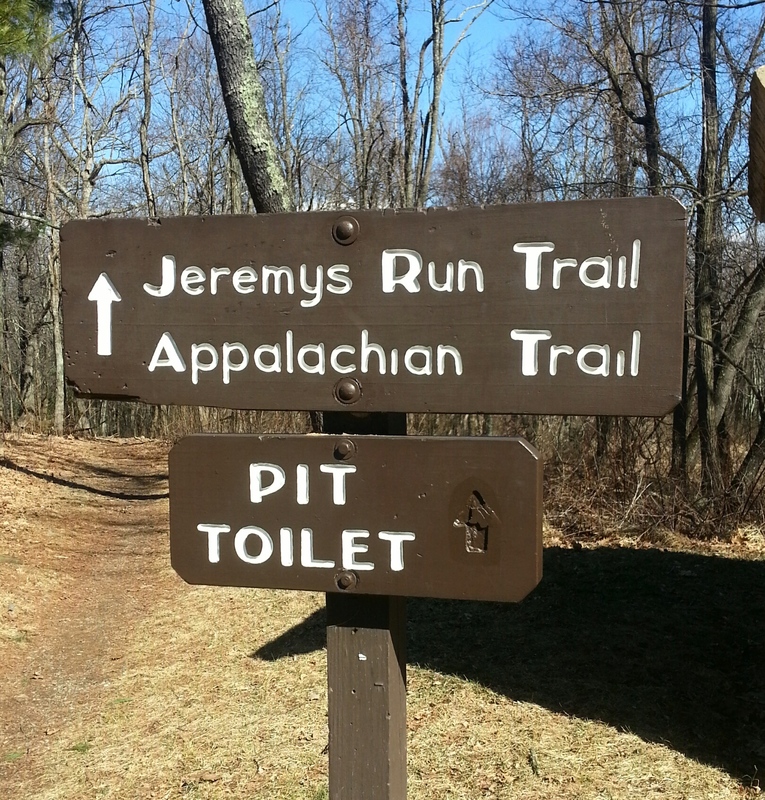 Always nice when the trail head has a privy! We cut around the back of Elkwallow Wayside where there is a little store, gas and bathrooms during the main season. Today, however, nothing was open. Turning right onto the AT, we crossed Skyline Drive and began our first climb of the day ascending 500 feet up to the Piney Ridge trail. As I drove to the trail head this morning, the thermometer in my car kept rising and falling as I wound my way down Skyline Drive. When it showed 39 degrees, I worried I hadn’t brought enough layers. Well, as I plodded up that first hill my fears were put to rest! Plenty warm with that sun out…and the occasional gusts of wind became a welcome occurrence. Turn off for the Piney Ridge trail. At the turn off for the Piney Ridge trail is a another trail (looks like a driveway in the picture above) that goes to the PATC Range View cabin. This would be an excellent place to stay as there are many good loops you could hike in this area! Made a note since I am a PATC member! 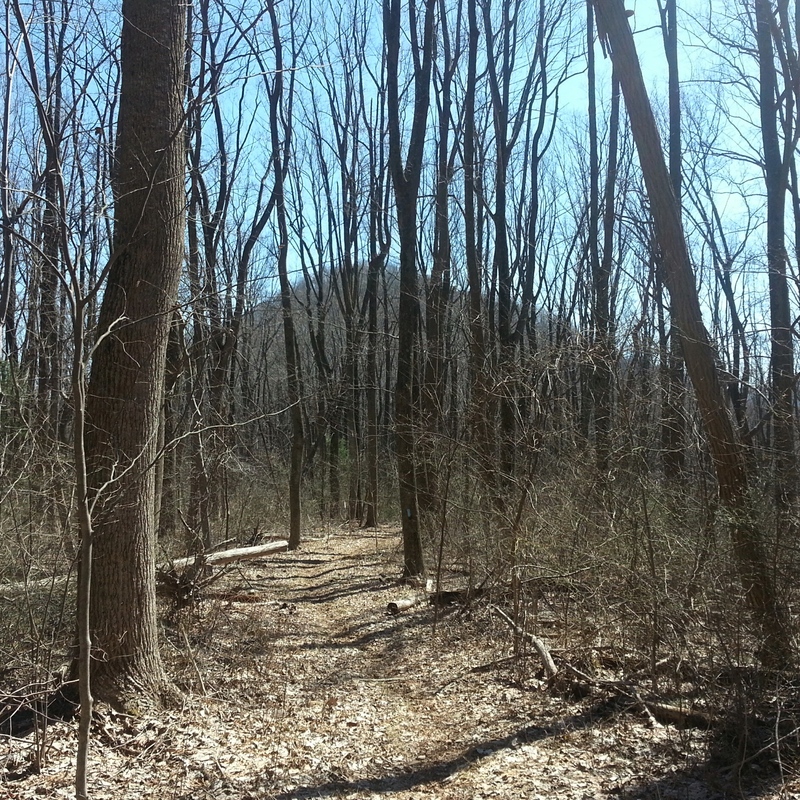 The Piney Ridge trail drops, rounds a mountain, then meets up with the Fork Mountain trail. 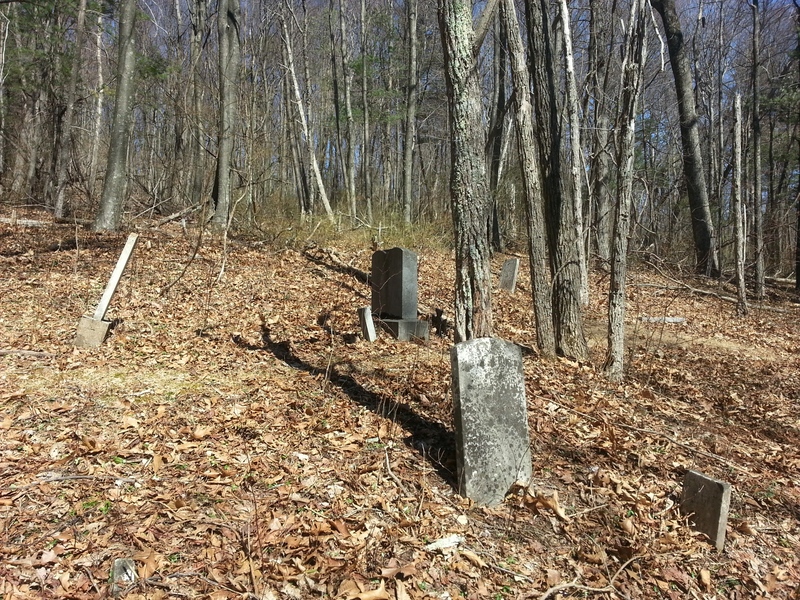 Along the way down, I happened to glance to my right and saw something odd sticking up…I went to investigate and found a little secret cemetery! What a beautiful spot. I murmured many a “I’m sorry” as I stepped on graves, over graves and around graves to read the tombstones left intact. I don’t know why I feel a need to talk to tombstones, but I do…who knows…maybe the spirits are still around and I would rather be on good terms! When I left, I said “Thanks for welcoming me, I enjoyed this place” and felt an immediate warmth fill me. Back on the trail I felt I was no longer alone. Just before the Hull School trail there was a big old tree. As I approached, on this very windy day, I asked the tree to hold on to all of its branches while I passed beneath it on the trail. It was gracious enough to grant me my wish. Another hundred yards up the trail I heard a massive thud behind me…the tree could hold no longer…a huge branch lay across the trail where I had just walked. Thank you spirits of the mountain! I love visiting old cemeteries! A quick break was welcomed at the intersection of the Hull School trail. We had descended 1000 feet since stepping off the AT. Reading the cement trail marker I saw we had only 0.8 miles to go before getting to the Thornton River trail where we would begin to ascend back to Skyline Drive. 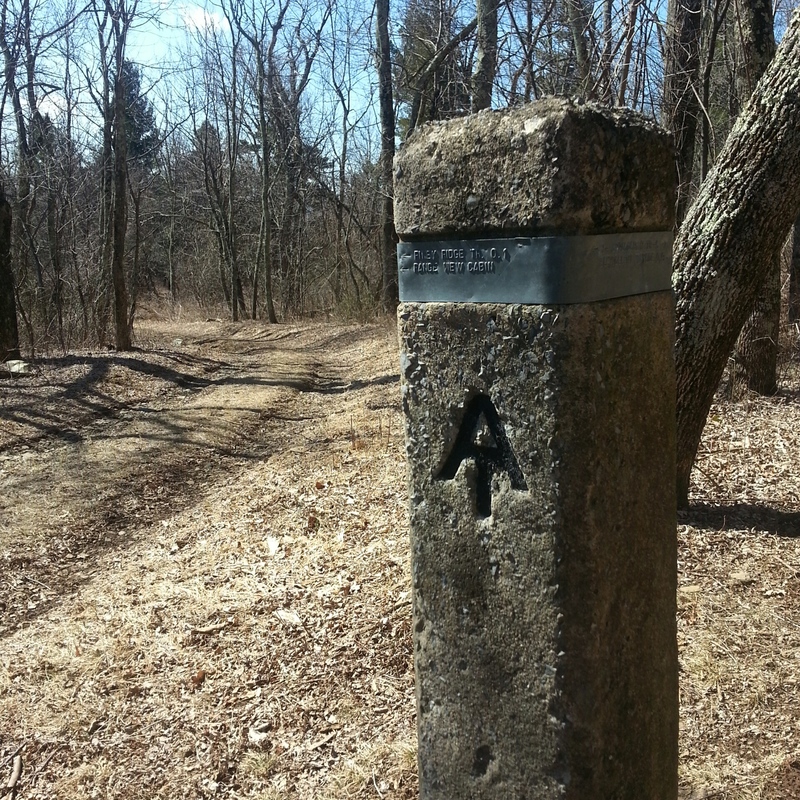 Approaching the intersection of the Hull School Trail. Dead center is Fork Mountain! Sidekick Pauli found a spring! I didn’t take this pic until after I made it past my first crazy crossing! Last water crossing…yay, stepping stones! Cool old car on the side of the Thornton River trail. 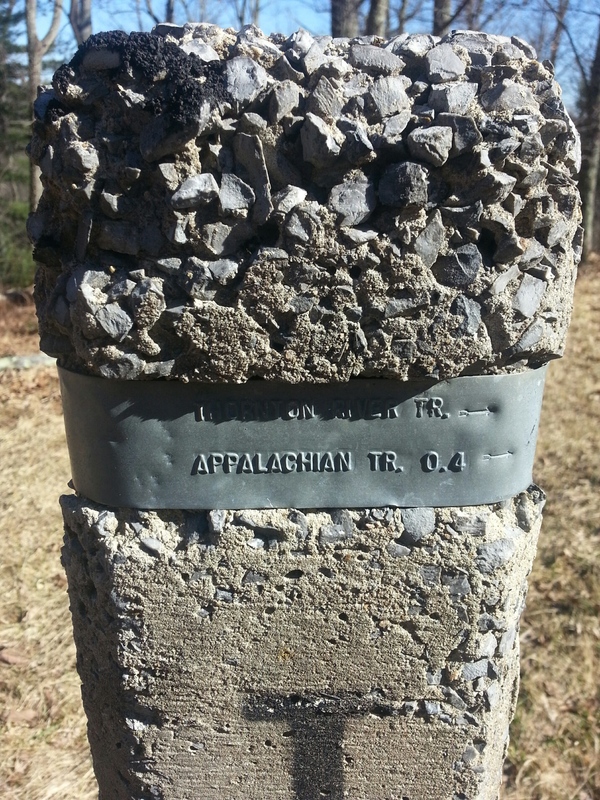 Once reaching Skyline Drive I had planned to access the AT again and follow it back to Elkwallow. I had wet boots and my legs were tired from the extra bushwhacking! Taking the AT would have meant another 2.5 miles to my car. After 8.5 – 9 miles …UMMM…I don’t think so!!! When I saw the AT access was almost another 1/2 mile in the opposite direction…I literally said HELL.NO. and road walked back to the car! Posted in AT-Virginia, Off the AT...Exploring other trails!